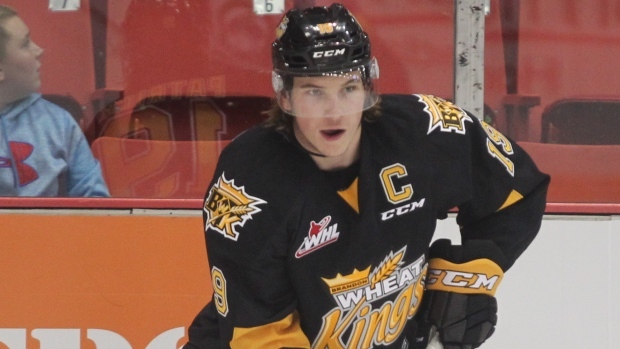 Nolan Patrick is on pace to make history – twice. TSN Director of Scouting Craig Button projects the Brandon Wheat Kings’ centre going first overall to the last place Colorado Avalanche – provided it wins the draft lottery scheduled to take place April 29 – in the TSN post-season mock draft. If Patrick goes No. 1 over rival centre Nico Hischier of the Halifax Mooseheads, he would be the first Manitoban chosen No. 1 and the first major junior player to go first overall despite missing more games (39) than playing (33) in his draft year. Patrick was sidelined by sports hernia surgery and an upper body injury this season. But it’s what Patrick did in the games he played – scoring 20 goals and 46 points – that solidified his position as the No. 1 pick. This on the heels of a phenomenal 102-point season with Brandon in 2015-16 as a 17-year-old. Performance and pedigree lay to rest any concerns Button has about Patrick’s ability to stay healthy. The standard for fewest games played by a No. 1 pick from major junior hockey was set by Billings Bighorns defenceman Gord Kluzak, who played just 38 games in 1981-82 before Boston picked him first overall. The TSN mock draft was conducted in reverse order of the final standings with selections made for all 14 non-playoff teams, plus the expansion Vegas Golden Knights. The Vancouver Canucks, who lost their last eight games to place 29th in the final standings and secure the No. 2 seed in the lottery, have never picked first overall in the 48-year history of the modern draft. If their bad luck in the draft lottery continues, they will get a terrific consolation prize: Swiss sensation Hischier, who collected 38 goals and 86 points in 57 games this season. Hischier excelled at the World Junior Hockey Championship, scoring four goals and recording three assists in five games. He had an overtime winner against the Czech Republic in the preliminary round and scored both of his team’s goals in a 3-2 loss to the Americans in the quarterfinals. The Golden Knights and Arizona Coyotes are co-No. 3 lottery seeds. Button has Vegas taking Portland centre Cody Glass third overall. Button says the Winnipeg native has caught the eye of Vegas assistant general manager Kelly McCrimmmon, who previously served as coach and GM of the Brandon Wheat Kings and has had a front row seat to Glass’ development. At No. 4, Button has Arizona selecting Swedish defenceman Timothy Liljegren and at No. 5, New Jersey choosing Windsor centre Gabriel Vilardi. The only other Canadian team in the draft lottery is the No. 12-seed Winnipeg Jets. Button projects the Jets taking Finnish defenceman Miro Heiskanen of HIFK Helsinki. “Heiskanen is a good fit because he’s a smart player, incredibly efficient and rarely makes mistakes,” Button says. The Avalanche has a 17.9 per-cent chance of winning the lottery, the Canucks, 12.1, and the Coyotes and Golden Knights, 10.3. Winnipeg has a 2.0 per-cent shot at winning.